It is the last week of Radio Romance! I feel like we have so many things to address and only 2 hours to do it in. We left off with Gu-rim finding out that Ji Su-ho is not Woo Shi-woo. Awkward! Ji Su-ho has some explaining to do, so I feel like a lot of heartfelt conversations and flashbacks will abound in this episode. Possibly even some single tear droplets? We also got a little bit more of a taste of Tae-ri’s background. I really wish her background came out earlier so I would have sympathized with her more in the opening episodes. At least it came out though, hopefully her image gets a jump start with a succesful drama with Ji Su-ho. We are live-ish recapping The Great Seducer right after this episode finishes! The Great Seducer will be taking over our Radio Romance Monday/Tuesday live recapping spot starting next week. If you are looking for another drama to get into once Radio Romance finishes then I suggest checking it out. It is a makjang with 19-20 year olds and has crack drama written all over it. Guilty pleasure watch alert! GR waites for JSH at his place. He comes in and he hugs her right away. But she asks him, what does it mean ‘JSH killed Woo Ji-woo’? JSH steps back a moment. GR wants to know why JSH said he is WJW, tell me, otherwise I won’t know. 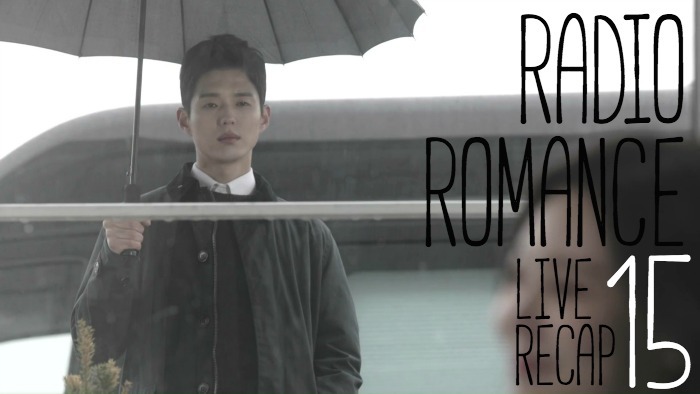 GR – In retrospect, in the hospital there was another boy next to you, was he Woo Ji-woo? Can you tell me everything, I want to know. JSH tells her that WJW is dead. He died at 16 years old because of him. When I was little, my only friend in my life was WJW, JW lived in the hospital even before he was 10, but he was a bright guy. Even though he said he would die soon, he lived a lot happier than me. (If I win this music contest, I am going to confess to GR). And GR, you were the one that WJW liked and I also liked you. GR – So, the hallway in the hospital? JSH – It was me. GR – Why didn’t you want me to take off my eyecover and why did you say you were WJW? JSH – I was afraid that the GR that my friend liked and that I also liked…one day on my way home I saw you after following you and after that I met you several times without WJW noticing it. I couldn’t tell WJW that I met you secretly. (we see WJW seeing JSH kissing GR). Then, (final music contest day. If WJW wins he will confess to GR). JSH goes to the contest and accidentally bumps into GR. He apologizes and runs away. But someone calls him. He doesn’t want to answer it, but it is WJW. WJW is across the street and waves at him, but JSH turns around. WJW doesn’t know what is going on so he tries to cross the street and gets hit by a car. JSH – Because of me, because of me…I didn’t go to the funeral and i just slept all day. I didn’t do anything and slept. Since then, I can’t sleep anymore, I never wanted to see you again, but after seeing you, I couldn’t handle myself. I know I shouldn’t do that, and I liked you more and more. GR hugs JSH and pats him on the back. GR – JSH could have thought about WJW while seeing me. She pulls him into a tighter hug and he rests his chin on her. GR – So, you couldn’t sleep without sleeping pills since then? JSH – Are you okay? Am I still okay to you after listening to me? GR – JSH is JSH and WJW is JSH’s best friend. I love JSH. Boss Mom tells Appa that a lot of people will come to JSH’s families house. But then Da-sul sends Appa a threatening text. Boss Mom and Appa start arguing about this, what will they do about Da-sul? Boss Mom says Appa took JSH in when she had a Misscarriage. She is having a really hard time because of all the rumors, if everything is revealed, then we are done. JSH doesn’t listen to me anymore, so you bring him back. GR checks the fridge and comments on how JSH must like fridges. Meanwhile JSH is on the phone. He doesn’t want to have a public birthday party anymore. GR tells him that she wanted to cook for him, but she doesn’t have any ingredients. Then she checks her watch and sees that it is midnight, so it is his birthday. they go to sleep together in his bed. JSH just stares at the ceiling while GR looks at him and asks him all sorts of questions. Why is he so shy? But then JSH turns toward her and they look at each other. JSH asks if he can hold her hand. She extends it to him. they hold hands and tell each other good night. JSH closes his eyes and falls to sleep. GR watches him sleep and smiles. Appa is preparing for JSH’s birthday party when Da-sul shows up. She asys they put her in hell, they are so powerful that they can even block the press conference, so she will just follow them around and harrass them. She has hit rock bottom so she isn’t afraid of them, she can endure it. Boss mom says Da-sul will be out if she releases the news about the affair. But Da-sul says that she doesn’t care so she will be around and start to threaten them (Da-sul also speaks banmal to Boss Mom and Appa). She leaves and the parents wonder where JSH is. JSH is still at home asleep. GR calls her mother and asks her how to make meeyukguk (seaweed soup). Her mother is shocked…for JSH? GR smiles and then we see her making the seaweed soup. Afterwards she goes to his room and watches him sleep a little bit before telling him Hello/Good morning. They talk about him sleeping so well, she knows because she watched him all night. She tells him happy birthday and wants to know what he wants to do today. He says he doesn’t want to do anything, just eat and sleep and rest and go somewhere quiet and just hang out with GR. GR tells him that she made meeyukguk so they can eat and do whatever. Across town, the Boss Mom is steady calling JSH, but he isn’t picking up. So she calls the company man, but he isn’t picking up either. Then we see JSH sitting to eat GR’s meeyuk guk. She tells him that she ddin’t pick him a birthday present yet, but don’t thinks she won’t give you anything, she will! She just doesn’t know what he likes. JSH smiles and starts eating the food. He says the taste is a little……(she says, don’t eat it! Don’t eat it! )….the taste is a little strange…..(don’t eat it!). She goes over to him and he pulls her onto his lap. He looks into her eyes and tells her that he doens’t need any presents. Across town, everyone is waiting for JSH to come to his birthday party. The mother tells them all that he isn’t feeling well so he can’t come out. Everyone thinks that the rumor might be true. Boss Mom apologizes and continues with the party. She shows a video of JSH thanking them all for supporting him. Meanwhile JSH and GR are having a wonderful Bday as they brush their teeth together while holding hands. GR thinks it is just like a drama and it feels like he is hers now. JSH says he has something to give to her. He should have given it to her a long time ago and now he is giving it to her. He gives her all the letters and we see a flashback of JSH dropping off al the letters at GR’s hospital room door. JSH tells her that these are all the letter that WJW wanted to give to you. WJW gives JSH the final letter. It is to his muse Song Gu-rim. When he wins the final, he will tell her person-to-person. We see JSH putting the letter in a drawer and not giving them to GR. GR opens the letter and says it is not a letter to her, it looks like a letter to him. WJW – Hey JSH, I liked you when I first saw you. Maybe you are surprised that the letter i sent GR, I knew that you don’t deliver my letter to GR anymore, because you like her. So I started to write letters to you instead of GR, did you confess to her? My best friend JSH and GR…i hope that you guys are happy together without me, I hope that you will have a happy life. GR says she feels like she is in the middle of JSH and WJW’s love. She smiles at JSH while JSH looks contemplative. TR and the Company man go out on a walk. They shoot the breeze a little bit but then a bicycler comes to close to them so Company man pulls TR out of the way. They have a moment where they look at each other, but then they break it and start arguing. TR yells at him, he hasn’t confessed to her for many many years! But then Company Man kisses her suddenly and they happily makeout at the park. At JSH’s place, GR tells JSH that they might have to do the radio now. Kang called, he wants me to bring you to the radio station. They drive there and think it will be great to record the radio program in advance, that way they can date afterwards. So they record the radio program in advance with JSH saying it is 4 am with JSH’s Radio Romance and they are together. Afterwards, Kang and the AD want to eat together with JSH, since it is his birthday. But the company man runs up and tells JSH that he needs to come quickly. He fills him in on the repercussions of him not going to the birthday party. he can’t contact Boss Mom anymore and Company Man checked on Jason, he has a connection with Boss Mom just as he did before. So he’s basically a spy. Cut to Jason talking to Boss Mom. Jason says he went to the cemetery with JSH and he punched him, that is the real JSH right? But the Mom is upset, she says that is not JSH, just tell me what he is doing and what his schedule is. JSh goes into Jasons room and sees all the hate letters. Then he sees a case report about himself and reads it. Jason comes in at that moment. JSH wants to know if he studied him enough, what is his case, how did he diagnose it? How long has he been a spy? Did she give you more than I paid you? What more do you want? Jason doesn’t want him to be upset but JSH says that is one of the feelings he wants right? What should he do, cry or be angry? he isn’t curing him, he is hurting him more. Are you happy that I showed you my anger? Why do you think I am angry? I am angry because, after WJW, I thought you were my true friend, but you betrayed me, that is why I am angry. Get out from my house. JSH leavs and Jason looks taken aback. Da-sul gives an interview with a reporter team. She recorded what Boss Mom said and plays the recording for them. Then she records her interview and it goes live. She had an affair with JSH’s dad and Boss Mom threatened her and fired her. Everyone watches this on the internet. GR calls JSH and wonders if he saw the breaking news. They meet at Kangs place and GR gives JSH a present. It is a plant that Kang gave her when she became a writer. This plant has a strong life so she will lend it to him. JSH says he envies GR because she loves her mom. But GR says that he loves his mother a lot too and his mom knows that. JSH shows his true emotion to someone you really love, she saw it many times, he expresses his true feeling to his mother and his mom should know that also. Kang also talks to JSH about the breaking news about JSH’s family. JSH wants to have a press conference about his family, but the press conference might affect their radio program. Kang tells him to do what he needs to do and they will wait for him. JSH goes to his family house and meets with his mother who is watching the news interview over and over again. he asks were his father is. The mother turns off the TV and says she doenst want to fight him today. But JSH says she isn’t like herself and he will take care of it. If they have any chance of being happy, then it is now. Appa is drinking wine somewhere. He lights up when he sees JSH and asks him what they can do. JSH tells him that he should be next to mother, he shoulnd’t think about himself in this situation, he should think about mother. JSH says that Umoni was always broken when he wasn’t at hom, Appa never saw it, but JSH always saw it. JSH leaves and stands outside his fathers room for a moment and sighs. JSH takes a deep breath, and walks out to the press conference. All the news people swarm him. Then we see him waiting behind the scenes until the company man tells him that it is time. He gets up to go out and the mom stops him, what is he going to say? But JSH just keeps walking. He gets to the press conference, everyone is there. Jason is also there. JSH takes all the questions, Are they really a show family? JSH says his family is a show family. As you expect, we acted like the perfect family and we earned a lot of money and it is true that we took advantage of that image. As you all know, I am not Nam Ju-ha’s true son (Boss Mom). When I was little it was shocking to me as well, but now I think my existence was pain for my family, so to protect me, my parents told a lot of lies. It was all for me, without me, all the lies wouldn’t have started at all, even though my Mother raised me as her own son, my mother is not my real mother, but she did her best for me to achieve this point and honestly, I don’t know about true biological mothers, but if you call someone who you spend all your time with your mother, then she is my mother. He looks at his mother and she looks back at him. The press conference ends and JSH leaves through the reporters once again. The door open and he is confronted by even more reporters as he walks through th building. Everything is in slow motion as he continues to walk away. Meanwhile GR watches all of this as it happens on the news. At the same time, the drama is in jeopardy, JSH might be out of the drama because the investors are upset. But TR wants to know why? She starts to go off on all of them, her parents also separated with affairs and her father also left the house. They shouldn’t talk badly about JSH! But then she goes to her car and starts crying, she calls the company man and says she wants to see him. The company man says he is at his house and she threatened him, why does she want to see him? She cries and says she didn’t know that he had that much of a hard time, she was threatening him with all his pain. Cut to JSH at the company mans place. He talks to GR and says that he feels good. he feels free now. he will be fine and GR should get a good nights sleep. he hangs up and watches the news about his family, perhaps he isn’t doing as well as he told GR. Then we see Appa getting swarmed by reports. It looks like he has been drinking. Umma also might be swarmed by reporters, but she just keeps driving. Kang shows the director the news and the director wants to know if they are still going to do this show? Kang says it will be okay, everyone is asleep at 4am. He is sticking with JSH. But no one else is sticking with him. His drama is out and they want their money back. At the family house, his parents are in shambles. JSH listens to his father talking about how this might hurt GR as well. But Umma tells him to stop, she can’t live with him anymore. JSH drives around thinking about what his father said about GR. He also thinks about what the company man said about GR being hurt. GR calls him, but he doesn’t pick up at first. She says she is in front of his house, but there are a lot of reporters. She asks where he is and he says he is at his managers house. But he is really at the spot where he cried with her for the first time. he tells her that she shouldn’t go to the company mans house, they shouldn’t’ see each other today. He wants to see her, but he will just wait until everything gets quieter. He will call her back and her tells her to eat well. They get off the phone and GR wonders where he is, how does he find her so easily? She runs off. Then she finds him. We see her running up to the back of JSH as he looks over the Seoul cityscape, she back hugs him. She thought about it and she thought he would be there. He is probably worrying a lot, maybe he will be there. She thinks that JSH is enduring it all, he hugged me even though he suffered with WJW’s memory. He embraced me and I will do the same. JSH turns around and GR holds his face in her hands. She says she will be next to him (?) and then she kisses him. He pulls her closer to him and kisses her deeper and longer. This is a very long kiss. Lol, now I want to know what your sigh means. Is it a swoon sigh? Or another type of sigh? LOL *swoon sigh *sad sigh as it’s ending tonight.